WBB-Weekend Breakfast Blogging was started by the gorgeous, talented doctor and nutritionist Nandita from Saffron Trail to popularise breakfast among food bloggers around the globe. This time I am getting the privilege to host it in Monsoon Spice. Thank you dear Nandita, for this wonderful opportunity. Without much delay and unwanted Gyan (which I am good at giving ;) from me, let me come straight to the point. For this edition of WBB, your challenge is to cook anything with summer fruits and vegetables. Yes, the theme is WBB-Summer Feast. Go to your town/city’s Farmer’s Market and pick fresh season’s produce and make your favourite breakfast or brunch. Combine these summer fruits and vegetables with any ingredients of your choice and create something special which you and your family love. Choice of summer fruits and vegetables, the recipe, ingredients, method etc is entirely left to you. It can be something which you cook quite often or something which you came up by accident. It can be something that reminds you of your childhood days or happy time spent with your family and friends in summer. Cook anything your heart desires and blog about it. Sky is the limit! 1. Prepare a dish uses Summer Fruits & Vegetables which can be served as breakfast or brunch and post it in your blog during July ’08. 2. Provide a link back to this announcement page and feel free to use the logo. 4. The deadline for this event is July 31st, 2008. Please remember that no late entries will be entertained. 5. There is no limit to the number of entries that you might want to contribute. If you don’t have a blog but wish to participate in this event, send your entries with a picture, your name and recipe to sia[at]monsoonspice[dot]com before the deadline. I will post the recipes with your picture in my blog and include it in the round-up. Let us celebrate the spirit of summer with seasonal fruits and vegetables. I will eagerly look forward to your wonderful entries to make this one successful summer feast. Meanwhile, you still have got few more days to send in your entries for Raaga’s WBB-Express Breakfast. where's your WBB entry girl? Love the logo. You are superb with these logos. good theme! I will soon put some together.. Nice logo, Sia! ohhhh!! u r hosting JUly's WBB too? thats wonderful!! how do you make time for all this in your busy schedule?!?! I'm amazed!!! great going!! Sia, Nice theme. Will definitely try and participate. Nice logo Sia !! Busy with events.. enjoy !! Nice event with summer veg & fruits!! Lovely theme and a cute logo Sia. will try to send something yummy! Will get lot of breakfast recipes from your blog..So happy to see your announcement. Very pretty logo! I hope to come up with something nice for this! Sups, you seem to be hosting a lot of events nowadys!! Good luck with it! The logo is so pretty! Lady how do u get time for all this?? One event round up is pending and u r here with another one already ! Thanks for pointing to copy write issue. Kindly check my blog! oh nooooooo!! summer is a long gone here in new zealand. well, enjoy your hot days! nice event. its nice and sunny here in san diego. will send in an entry soon. This is a great theme for Weekend Breakfast Blogging. I have just sent you an entry. I have been following this very beautiful food blog sine past last few months and enjoy each and every post. 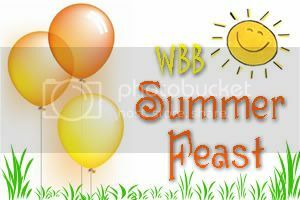 I missed participating in the last June08, street food theme but this timem on time to WWB-feast. I have recently mailed you my dish details for this excellent summer food theme. Cheers to passion we share! Hey thanks so much for adding up my very first dish link. But the party is on, and so i have mailed you my next dish details and links. Lets celebrate the feast at the fullest. Will surely participate in it. I am back with a new dish for WBB-feast.Have just now mailed you. Hey I' enjoying cooking so much because of this feast..
U r so quick in respond...! i have to come back to read this post again and figure what will qualify. i have vowed to particpate in as many events as i can!! Just made it in time...mailed my entry details to you.